Pour raw whole milk into a baking pan and let sit in the refrigerator for 24 hours to let the milk and cream separate. The following day, gently ladle the top layer of heavy whipping cream from the baking pan and transfer to a pint jar. Refrigerate the heavy whipping cream in the sealed jar up to two days until ready to use. Chill the mixing bowl and the mixer's whisk attachment in the freezer for 15 minutes. Pour 1 cup of the chilled heavy whipping cream into the cold mixing bowl. Secure the whisk attachment to the mixer, and mix the whipping cream on low speed. Slowly increase the speed to high, and add in 1 tablespoon sugar and 1/2 teaspoon vanilla extract. 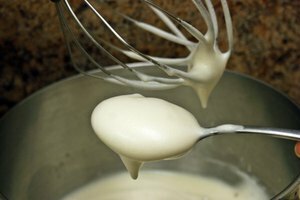 Continue to beat until stiff peaks remain standing up on the end of the whisk when removed from the cream. One cup heavy whipping cream yields 2 cups whipped cream. Use the whipped cream as a dessert topping or mixed into recipes immediately as time and exposure to heat will cause it to deflate. 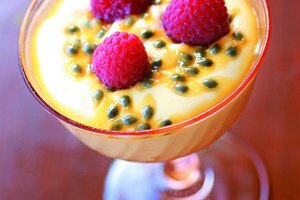 OChef: How Do You Make Heavy Whipping Cream?